"Olive Ripple" Waterman mechanical pencil, probably matched to one of the short and slender olive ripple pens with clips. In excellent + condition, working well. 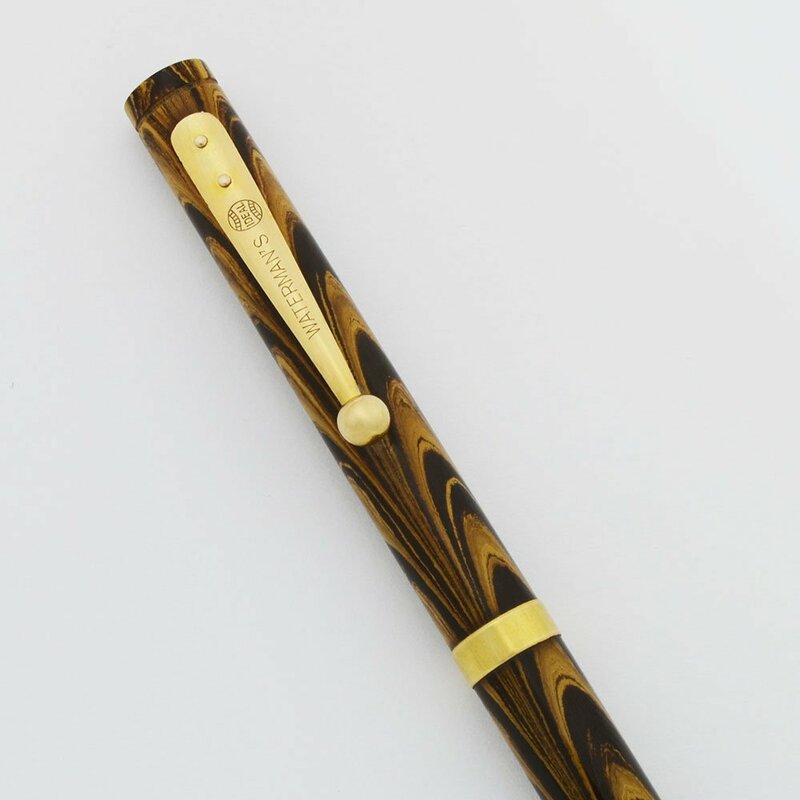 Product Name Waterman Olive Ripple. We're not certain which fountain pen went with this pencil, but our best guess is that it is the mate to a short and slender olive ripple pen with a clip such as the 52 1/2 V.
Filling System Takes thick style (1.1mm) leads and we will include a packet. Lead extends in the traditional, twist mechanism, but you may have to push it with your finger to make it retract. You remove the small top piece to access the chamber for storing leads. Color Olive hard rubber in a ripple design, with gold plated trim. Condition Excellent + condition. The body of the pencil is in great condition, with no scratches, dings, chips, or dents. The clip and trim ring are beautiful, with just some micro-scratching. This is a slim, diminuitive mechanical pencil. It looks really nice and it's working well.